IFOPT is a prCEN/ Technical Standard in development. Review comments are welcome. IFOPT defines a model and identification principles for the main fixed objects related to public access to Public Transport (e.g. stop points, stop areas, stations, connection links, entrances, etc.). 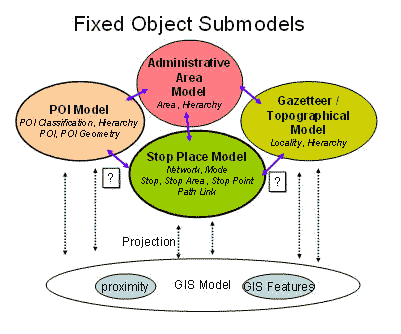 IFOPT Standard builds on the TransModel Standard to define four related sub models – See Figure 1.1. Stop Place Model Describes the detailed structure of a STOP PLACE (that is station, airport, etc) including physical points of access to vehicles and the paths between the points, including mobility hazards. Point of Interest Model Describes the structure of a POINT OF INTEREST including physical points of access, i.e. ENTRANCEs. Gazetteer Topographical Model Provides a topographical representation of the settlements (cities, towns, villages etc) between which people travel. It is used to associate Stop and Station elements with the appropriate topographic names and concepts to support the functions of journey planning, stop finding, etc. Administrative Model. Provides an organisational model for assigning responsibility to create and maintain data as a collaborative process involving distributed stakeholders. Includes namespace management to manage the decentralised issuing of unique identifiers.